BOWA Secretary Chris Howland, from left, welcomes model Jordan Quillen and Misty Killebrew to the annual Fall Fashion Show Luncheon at Bay Oaks Country Club. 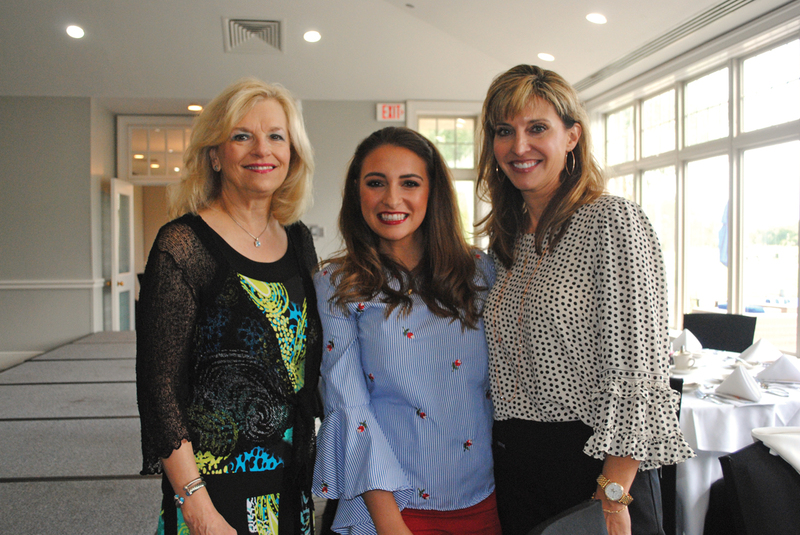 BAY OAKS Women’s Association kicked off its new season with an elegant Fashion Show Luncheon at Bay Oaks Country Club that opened with a champagne reception as members and guests began arriving. President Susan McCoy and Vice President Amy Schweers joined Hospitality Chairman Terri Steinkamp and her committee in welcoming the arriving crowd, which included Mary Colombo, Gaye Wylie, Emmeline Dodd, Cheri Burke, Ann Lyon, Judge Holly Williamson, Janet Greenwood, Marilyn Lunney, Lea Bodie, Betty Woodhouse, Janet Gortno, Misty Killebrew, Nancy Smith, Eileen Hult and Sharon Dillard. Before they hardly had had time to say hello to one another, in walked Jackie Daley, Margaret Vail, Sharon Phelps, Carol Murphy, Angela Bivens, Norman Ogletree, Dr. Kimberly Weathers, Glenna Crist, Debbie May, Ann Dooley, Ruth Beecher, Sue Laabs, Mary Alyce Hall, Rita Armstrong, Linda Guice, Jean Dupre, Peggy Green, Amy Roppolo, Debbie Roan and Past President Jodi Schnabel. 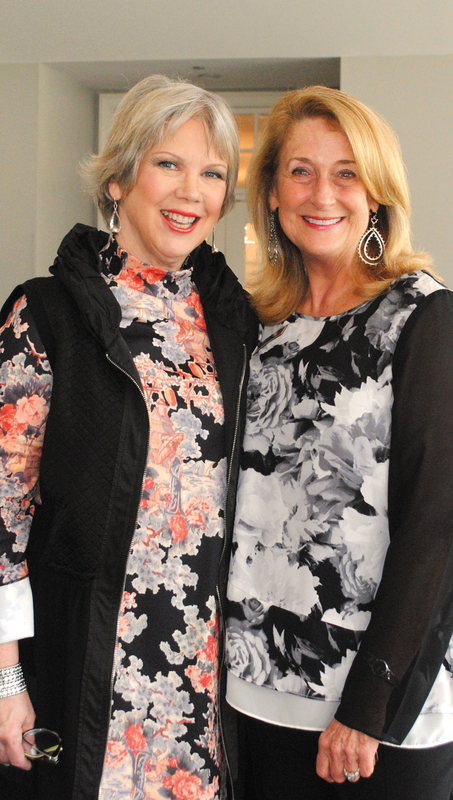 Hospitality Chairman Terri Steinkamp, right, goes over plans for the BOWA Fall Fashion Show with model Diane Saltzer on arrival at Bay Oaks Country Club. Soon, they were watching models Sue Broughton, Valerie Brumfield, Susan Franklin, Julie Gallager, Susan McCoy¸Lola McLain, Martha McWilliams, Darla McKitrick, Jordan Quillen, Diane Saltzer and Cindy Zook present fall fashions from Dillard’s at Baybrook Mall, with Bay Oaks General Manager Stephen Morris escorting them. Much to the delight of Lucille Terraso, Rose Sobotik, Sandy Buyajian, Elaine Rister, Georgia Piwonka, Carol Bobo, Julia Guzman, Mary Smith, Heather Hernandez, Beverly Braden, Lisa Schulte, Linda Fincher, Gail West and Secretary Chris Howland, who then enjoyed Shrimp Escabeche and Blueberry Crumble. Bay Oaks Country Club members will get “A Taste of Asia” Saturday, Nov. 3 when BOWA hosts its annual gala at the club. Chairman Pam Clary says the focus will be on the Far East with Chinese dancers performing, beautiful red and gold decorations, plus gaming tables and the popular Main Street Band. Guests will be sipping on Singapore Slings, wine and champagne before enjoying Beef Teriyaki and Coconut Encrusted Shrimp. Sounds like a delightful evening is ahead. HOUSTON SYMPHONY League Bay Area members also got their season off to a happy start as Anita Gale hosted a Wine & Cheese Party for prospective members at her lovely home in Nassau Bay with Vice President Ann Morgan chairing the event. Nearly 80 members and guests enjoyed tasty appetizers and desserts provided by members as all were entertained by member Alice Steele’s trio Arcadia. Another highlight of the evening came when the children of Dr. Gerard and Nicole Abreo, ages 3-15 and known as the Abreo Family Strings, played several classical pieces on their violins, with beautiful music filling the home. All nine Abreo children have been students of Beatrice Stanley since the age of three, and she says they are a joy to teach. Afterwards, the Abreo children and the Arcadia trio performed together – much to the delight of all. League President Nina McGlashan and her husband, Bob, were there to welcome the crowd that included Al and Natalie Ong, Dr. Patrick McKinney, Julia Guzman, Sandy Conway, Betty Geehan, Sallie Watts, Gayle Nelson, Jean Raffetto, Donna Ward, Betty Gilfillan, Karen Brumley, Angela Mendoza, Dana Puddy, Lisa Brandenberger, Jane Lackow, Jean Gray, Bill Straight, plus Pat Biddle and her husband, Ron Kahl, to name a few. Hostess Stacy Bush Lyon, left, welcomes Jenny Frantz to her home for Clear Lake Area Panhellenic’s Fall Friendship Tea. 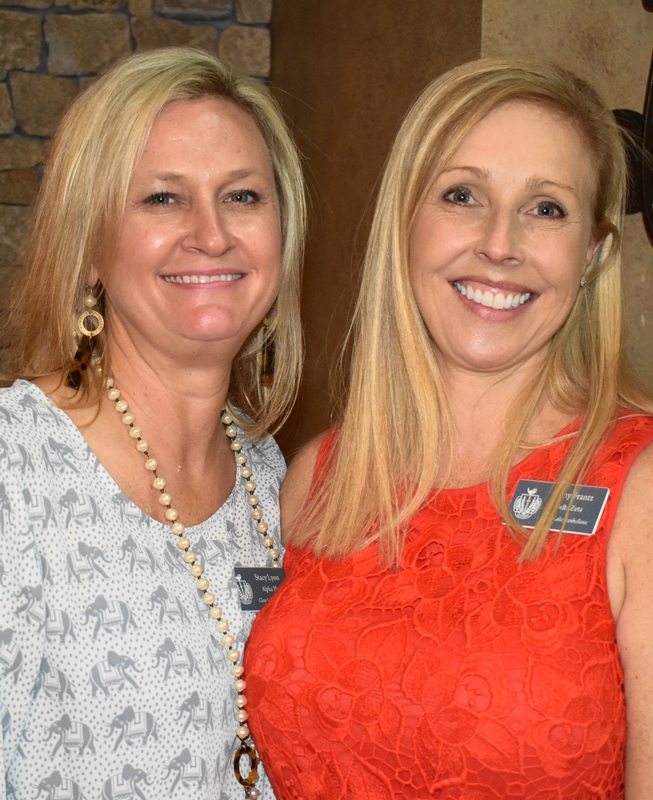 CLEAR LAKE Area Panhellenic members were all smiles as they began another season with their annual Fall Friendship Tea at the lovely Clear Lake home of Stacy Bush Lyon. This year’s theme was “Around the World in 80 Days,” which also will be the theme of their popular fall fashion show luncheon Friday, Nov. 2, in South Shore Harbour Resort’s Crystal Ballroom. President D’Lisa Johnson was there to greet the arriving crowd, as was Chairman Kay Lee Benoit and the hostess, plus several members of the executive board. Hot topic of conversation was, of course, the upcoming style show luncheon, in which most all members have a part. In fact, members brought food from different countries for the tea, to get everyone in the groove — including Sally Jordan, Linda McCormack, Sheryl Williams, Ruth Beecher and Judge Holly Williamson. Some of the others enjoying the annual gathering included Peggy Clause, Jill Reason, Laurie Vaughn, Jill Smitherman, Sue Broughton, Judie Ferguson, Jo Nell Hunter, Jo Cat Bruce, Karen Douglass and Jenny Franz.